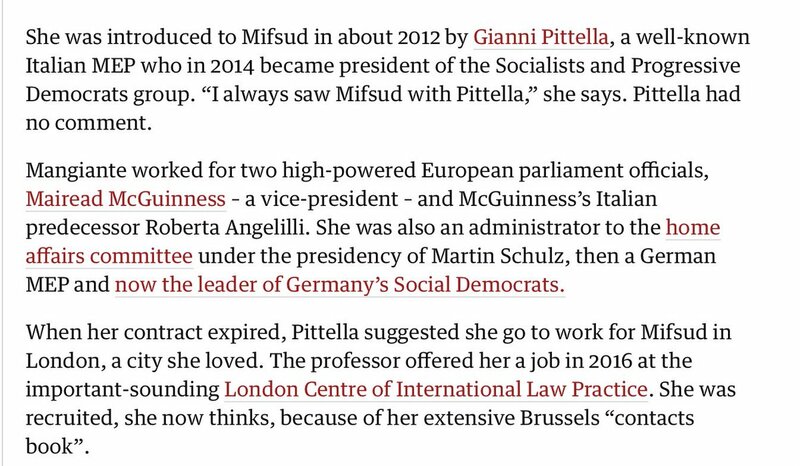 According to her own testimony to the Guardian, Mangiante met Joseph Mifsud in 2012, and then worked for him in 2016 when she first encountered Papadolpous. By that time she was already friends with Wiffen. What is the beef with Soros? (Except his Jewish Hungarian background - Hungary was one of the last most desperate Nazi parts of the holocaust. Until 1944 most Hungarian Jews were safe). 2 tweets to follow. It’s not about elites. Or money. Neither Banks, Farage or Wigmore will ever mention their extreme indebtedness to the hedge fund billionaire Robert Mercer who funded both Breitbart and Cambridge Analytica. 2. Britain is in an astonishingly dark place. The rule of law seems to have broken down. While major industries and services plan to relocate because of Brexit, our governing party is engaged in endless manoeuvres around the measly careers of a few would be ministers. Now new data has opened a small window into Trump’s social media machinery, and in particular the role played by the now-defunct Cambridge Analytica. Public statements and insider accounts have painted a muddled and contradictory picture on whether Trump’s Fb campaign targeted voters using Cambridge’s vast store of dubiously acquired data, once described by the company as containing 400 data points on 230 million Americans. Over the past few months I have collected 500+ Trump, Pence and RNC tracking URLs dating back to June 2016. I've shared bits & pieces of this (⏬) as I've been looking under the hood, in search of the truth behind Project Alamo/Trump marketing ops. The 500+ links are tracking links. They contain custom variables team Trump/Pence/RNC attached to links so they could measure & analyze performance via Google Analytics. I'll share full URL list once I'm done cleaning it up! 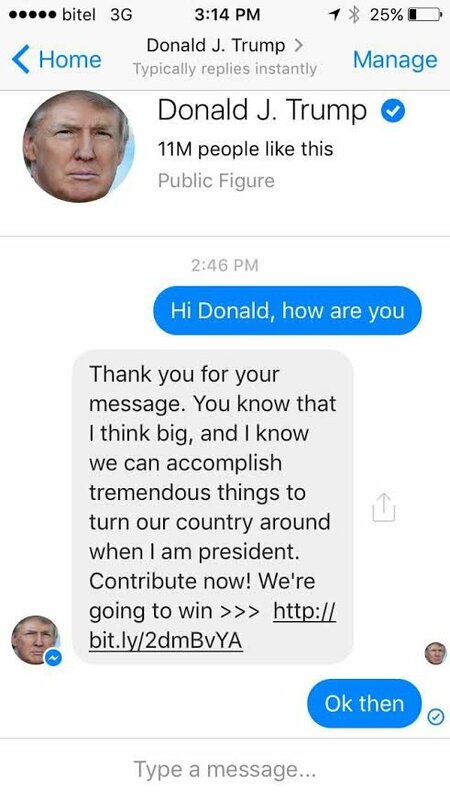 #1: Trump campaign used Facebook Messenger bots to communicate w/voters 1-on-1. I haven't seen this reported anywhere. If you have, pls send a link! All Americans, whether Democrat or Republican, are entitled to a fair voting system. If you can vote, you vote. I've used this info before, but now you need to be preparing. Make sure that you register within the deadline, which is usually 15-30 days before an election, although some states have Election Day voter registration. You can see a list of deadlines at (link: usa.gov/voter-registra…) usa.gov/voter-registra…. Granted, it was to convince people to play Rach 2 in once-in-a-lifetime master classes, or learn to conduct La Cenerentola, but the tools were still what's available to everyone else. Unless, of course, you engage in illegal and unethical behavior. It's important that we understand what this all means, and that it's not just techie stuff for someone else to figure out. The saturation of cable news networks driving agendas and sensationalism help create a perception of deep division. Add in social media echo chambers and the illusion is firmly reinforced. Note: on social media it’s not always YOUR voice echoed. That is important to understand. Tensions are rather high and many are emboldened to childishly act out. There are large enough percentages of the population actually protesting against the natural rights our nation was founded upon and the few funding, organizing, and steering drones or "useful idiots".